This is Jack D. Harvey's first novel. His poetry has appeared in a number of poetry magazines over the years. He hopes there are a few die-hard readers out there who will take the time and make the effort to read a novel based on imagination and fantasy and who have a passion for the written word and a tolerance for some more or less erudite clowning around with culture and language. He is retired from doing whatever he did before he retired and lives in a small town near Albany, NY. 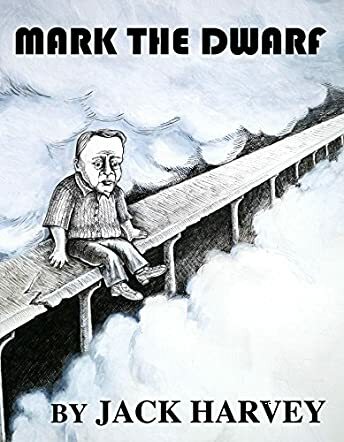 Mark the Dwarf by Jack D. Harvey is an epic fantasy adventure and space opera. When 73-year-old Mark receives two mysterious letters on his birthday, he knows some grand adventure is about to begin. He decides to follow the clues on the letters and “assume his burden,” even though he doesn’t know what that means. He goes to the bowling alley, but he isn’t sure what to expect at the Karmodian Bowlerama. But he doesn’t expect to end up on a gigantic platform high above the rest of the world. He isn’t prepared for the journey he is about to take through space and time. Who expects to meet clowns from outer space? What about midgets and dwarfs? Dangerous blondes? The further Mark travels, the weirder his encounters become. Chocolate covered writing. Lessons on quantum physics, linguistics, anthropology, and genetics. Mark soon learns that in space, anything goes. Mark the Dwarf is a satire or parody of many different elements, including the science fiction genre. Harvey pokes fun within his pages at all of the lessons taught, including quantum physics, linguistics, anthropology, and genetics. Even the more mature scenes are more focused on being funny than descriptive. Harvey created a unique book with characters and topics that haven’t been covered anywhere else. This crazy world is so imaginative that it is hard not to love every minute of Mark’s journey. Every time I thought Harvey couldn’t find another thing to make fun of, his writing would remind me of something pointless I learned in the past and I would laugh out loud.